Catalan Separatists Back Puigdemont, Reviving Prospect Of Independence Push : The Two-Way Fugitive former leader Carles Puigdemont says he'd likely govern from abroad if he's re-elected. He says he would do so remotely by a video link; a stand-in could read his speeches in parliament. Ousted Catalan President Carles Puigdemont speaks at a press conference in Belgium last month, after a snap election in Catalonia gave pro-independence factions a slim majority in the regional parliament. Carles Puigdemont aims to return to office as president of Catalonia — despite the fact it's unlikely he'll actually return there in person. He's currently living in Belgium, facing immediate arrest if he goes back home. The leading separatist parties in Spain's northeast region announced Wednesday they plan to support Puigdemont's re-election. If carried through, the move would reinstall a leader who was ousted from power, along with the rest of the region's leaders, by Spain's central government for unilaterally declaring the region's independence last fall. The parties' announcement Wednesday raises the specter of a renewed push for independence — and also raises difficult questions about how, exactly, Puigdemont might go about governing. After getting sacked by Madrid, the former regional president fled to Brussels with several other Catalan ministers to escape charges of rebellion. 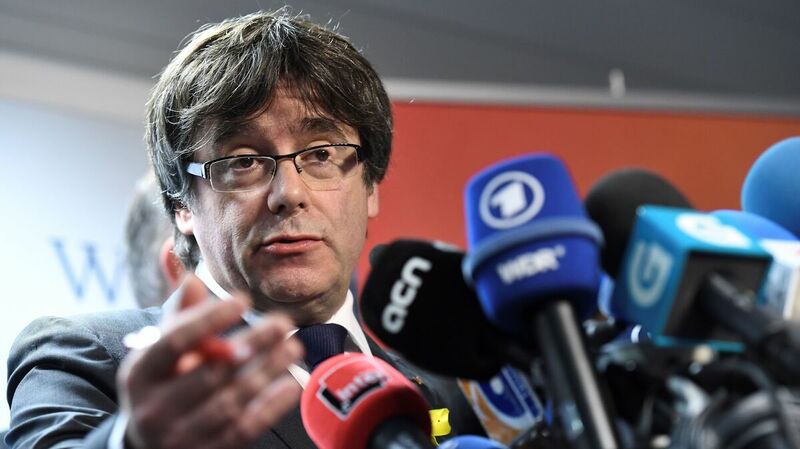 Those leaders remain out of the country, and Puigdemont has said if he's re-elected, he would discharge his duties remotely, via a video linkup such as Skype. "It is not possible to return to Catalonia," the ousted leader acknowledged Tuesday, according to Politico. Spain has jailed other pro-separatist leaders involved in the independence push. "He would be arrested if he sets foot back in Spain," Lauren Frayer notes for NPR's Newscast unit. "So he proposes ruling from afar, by video conference — possibly with a stand-in reading his speeches in parliament." Representatives for the Catalan parties cast the decision as the will of the people voiced in last month's snap election. That vote, which had been called by Prime Minister Mariano Rajoy after Catalan leaders were dismissed in October, handed pro-independence lawmakers a slim majority of parliamentary seats in the regional government. "The Dec. 21 result gave us the mandate to reflect the majority," Jordi Xucla, a representative for Puigdemont's Together for Catalonia party, told Spanish national radio Wednesday, according to Reuters. "The presidential candidate will evidently be Puigdemont." Opposition parties — not to mention the Spanish courts — are likely to contest the legality of the deal, which would become official next week when the new regional parliament convenes. "It's evident that for governing Catalonia you have to be in Catalonia, you can't do that via WhatsApp or as a hologram," said Ines Arrimadas, the leader of the anti-independence Ciutadans party, as reported by The Associated Press. "A person who is fleeing justice can't be the president." "Madrid must be made to understand that what is needed is dialogue, negotiation and agreement on the future relationship we Catalans want to have with Spain — one based on respect, recognition, cooperation and equality."